I am excited to have a dear friend and mentor, Dr. Kimberly Thornbury, with a Guest Post today. I had the splendid pleasure of working with Kimberly while we were both at Union University. It was then that she introduced me, a newlywed at the time, to her family’s House of Prayer. At the time, I longed for the day that I could start this tradition with children of my own. If you are wondering what to do with the charming Christmas cards forthcoming in your mailbox once December 26 arrives, enjoy Kimberly’s tradition and incorporate it into your home during 2015. When my two daughters were very young, I wanted to teach them about the importance of prayer, and also help them understand more about family and friends they had not yet met. In 2004, shortly after Christmas, I took an old green Pampers wipes plastic bin, covered it with construction paper, and filled it with Christmas cards our family had received that holiday season. 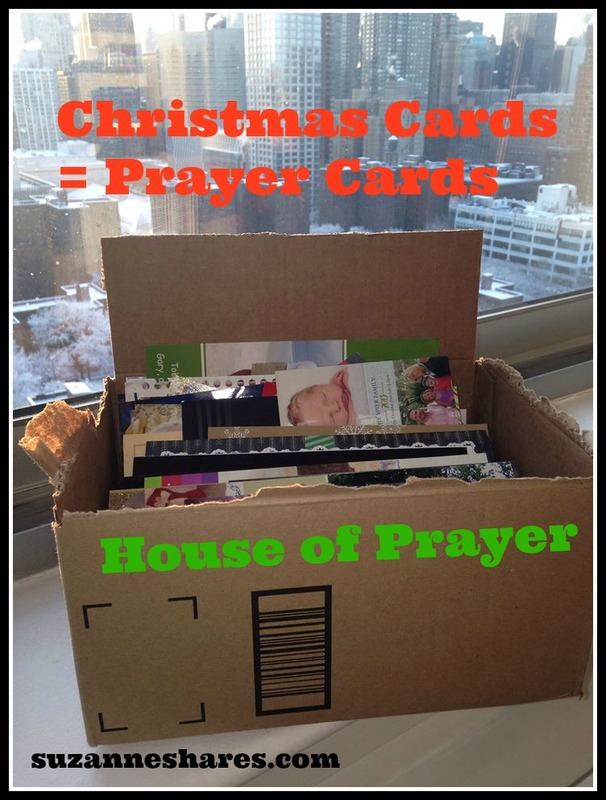 I stapled a 3 x 5 index card to each of the Christmas cards, and wrote down specific prayer requests related to that particular family or individual. During meal times, our two daughters were very interested in the new ritual of pulling out a colored photo. We would pass around the photo and pray specifically for the person or family on the card. Often times, we would write updates on the back of the card. Although we didn’t pray for these people daily, we would pray for them regularly and most certainly consistently. Our prayers became less monotonous, more creative and more intentional. Sometimes if we didn’t have a card on someone, the girls would take time to find a picture of someone in a magazine (for example the president of the United States) and create a card. Tragic situations, would often result in the girls writing words like “Haiti” on 3 x 5 card. That little Pampers box looked like a tiny house, and it was also a symbol for the Thornbury family being characterized as a “house of prayer.” Over the years we have moved to a small cardboard “Amazon” box, but I am sure more “pinterest” moms would make something super cute out of wood. I have worked with college students for over 20 years. As I mentor college students throughout their tenure at the University, often times I will pray over the students I am mentoring through my house of prayer card system. You can imagine their delight, when I copy the back of the card a few weeks before their wedding day, reminding them of God’s answered promises to them. Biology tests were passed, boyfriends who were not God’s best for them faded away, they reached their goal of graduation, and will soon be married to their beloved. Also, when someone is going through a particularly hard time (like a friend whose son was recently diagnosed with leukemia), we will find their card in the stack, update it, and pray for them right there on the spot. When we have guests come over, the house of prayer is a way for us to explain the Gospel to others, and our belief in intercessory prayer. I’m a fallen mom, and so thankful for God’s grace in my life. I am far from perfect, but this God-given idea has really worked for our little family, and been a tool to draw us closer to Him.